1 A None No Power Seat 1 A is a Business Class Exit Row seat with extra legroom. There is no floor storage for this seat during take-off or landing. 1 C None No Power Seat 1 C is a Business Class Exit Row seat with extra legroom. There is no floor storage for this seat during take-off or landing. 1 F None No Power Seat 1 F is a standard Business Class Bulkhead seat. There is no floor storage for this seat during take-off or landing. 11 A None No Power Seat 11 A is a standard Economy Class seat with a misaligned window. 11 F None No Power Seat 11 F is a standard Economy Class seat with a misaligned window. 14 B None No Power Seat 14 B is an Economy Class seat that may not recline due to the Exit Row behind. 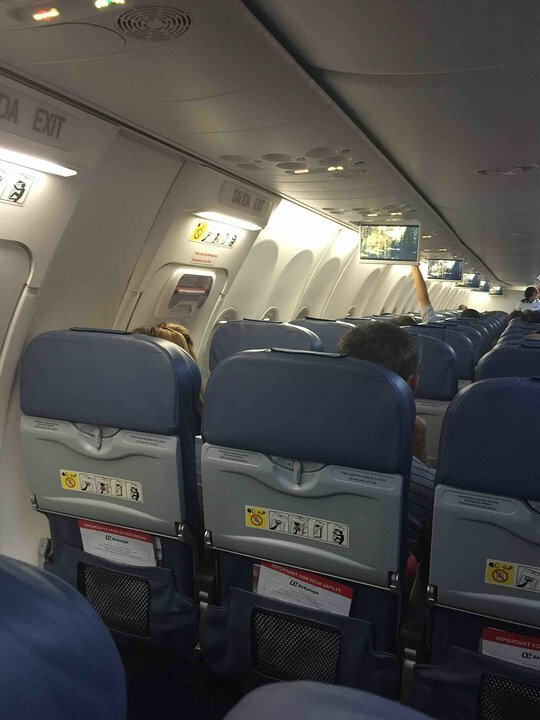 14 E None No Power Seat 14 E is an Economy Class seat that may not recline due to the Exit Row behind. 15 B None No Power Seat 15 B is an Economy Class Exit Row seat with extra legroom. The tray table is in the armrest, making the armrest immovable and slightly reducing seat width. There is no floor storage during take-off or landing. 15 E None No Power Seat 15 E is an Economy Class Exit Row seat with extra legroom. The tray table is in the armrest, making the armrest immovable and slightly reducing seat width. There is no floor storage during take-off or landing. 31 B None No Power Seat 31 B is an Economy Class seat in the last row of the plane that may have restricted legroom and limited recline. The close proximity to the lavatory and galley may be bothersome. 31 E None No Power Seat 31 E is an Economy Class seat in the last row of the plane that may have restricted legroom and limited recline. The close proximity to the lavatory and galley may be bothersome. 4 A None No Power Seat 4 A is an Economy Class Bulkhead seat with extra legroom. The tray table is in the armrest, making the armrest immovable and slightly reducing seat width. There is no floor storage during take-off or landing. 4 B None No Power Seat 4 B is an Economy Class Bulkhead seat with extra legroom. The tray table is in the armrest, making the armrest immovable and slightly reducing seat width. There is no floor storage during take-off or landing. 4 C None No Power Seat 4 C is an Economy Class Bulkhead seat with extra legroom. The tray table is in the armrest, making the armrest immovable and slightly reducing seat width. There is no floor storage during take-off or landing. 4 D None No Power Seat 4 D is an Economy Class Bulkhead seat with extra legroom. The tray table is in the armrest, making the armrest immovable and slightly reducing seat width. There is no floor storage during take-off or landing. 4 E None No Power Seat 4 E is an Economy Class Bulkhead seat with extra legroom. The tray table is in the armrest, making the armrest immovable and slightly reducing seat width. There is no floor storage during take-off or landing. 4 F None No Power Seat 4 F is an Economy Class Bulkhead seat with extra legroom. The tray table is in the armrest, making the armrest immovable and slightly reducing seat width. There is no floor storage during take-off or landing. Air Europa flies the Boeing 737-800 with 180 seats in a two-class configuration of Business and Economy. Seat 4 F is not right behind business, it us the second row behind business. Seats on these planes are quite tight. Music plays really loudly. No free drinks, except water. Flying economy I was surprised I was able to select seat 2C. Apperently Air Europa has nowadays at least 2 confiurations for their 737-800 fleet. 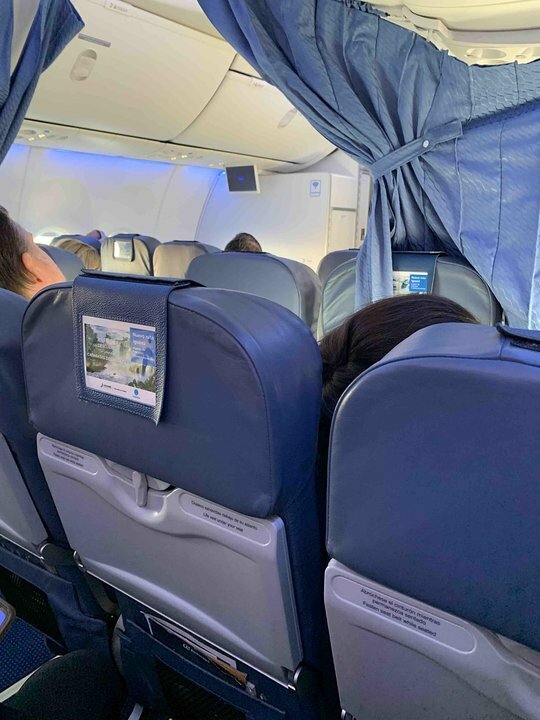 The newer planes (mine was aprox 9 months) seem te have the default Sky Interior configuration. Rows 1-3 can be sold as economy and business class. In lastcase the middle seat is blocked. On my flight, row 4 was a standard row, as well as the business class rows in front (In business class, the middle seats were left empty). There only was a curtain as a divider between rows 3 and 4. 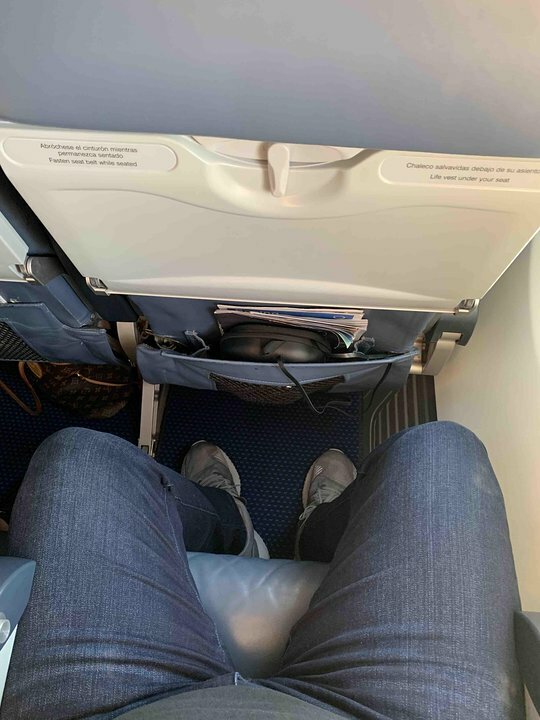 No extra legroom in row 4. Air Europa flies 1 versions of Boeing 737-800.